Try Mint Snuff All Mint Chew made from mint instead of tobacco, Melinda Rasmussen, student health director, said. Mint Snuff All Mint Chew will be given out at The Great American Smoke-Out, hosted by Midland Lutheran College on Nov. 17, Heather Ware, senior nursing student said. The Great American Smoke-Out will be held from 10 a.m. to 2 p.m. in the Olson Student Center across from the snack bar, Ware said. Ware emphasized that the Smoke-Out focuses on helping students stop smoking and chewing. The goal, Ware said, is to try to get people to stop smoking for just one day. This new product emphasizes an alternative to chew, Rasmussen said. All handouts, literature and Mint Snuff samples are free to students who visit the Smoke-Out booth, Ware said. Mint Snuff All Mint Chew is tobacco free, Rasmussen said. It contains no nicotine and is safe to eat. This 100 percent food grade product has helped thousands of people quit using tobacco, she said. For people with smoker’s breath, coffee breath or bad breath, Mint Snuff Pouches can be used as a breath freshener. Other uses for Mint Snuff include a throat lozenge, mint tea or for dry mouth, she said. Mint Snuff can be found in Fremont at the Amoco and KWIK Shop, Ware said. “We are going to try to get [Mint Snuff All Mint Chew] out to other stores so it can be offered to Midland students so that it can help them with their chewing habit.” Rasmussen said. Rasmussen said she hopes to get some Mint Snuff in the student health center for students to sample. 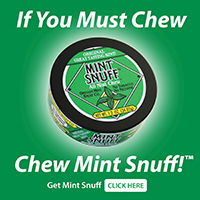 For more information on Mint Snuff All Mint Chew, attend The Great American Smoke-Out on Nov. 17th. Is there any danger in chewing tobacco? Parade Magazine, May 7, 1995Smokeless tobacco—in both of its forms, snuff and chew can deliver as much nicotine as cigarettes (or more) and for a longer period of time. Chewing tobacco, therefore, has the same negative effects on the body as smoking: increased risk of high blood pressure, heart attack and stroke. Using smokeless tobacco also greatly increases your risk of developing oral cancers and other diseases of the gums and mouth. Most disturbing is the fact that a third of the 12 million Americans who use smokeless tobacco are under 21 years old. “Smokeless tobacco does not enhance athletic performance,” says Ned Bergert, head athletic trainer of the California Angels. 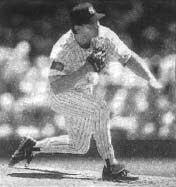 Along with pros like Mike Butcher of the Angels and Terry Mulholland (photo at left, a former Philly and Yankee, now a San Francisco Giant) Bergert is speaking out against smokeless tobacco. lf you’re trying to break the habit but feel that you need a transitional oral [alternative], you might consider sunflower seeds or products like Mint Snuff. (For more information, call. l -800-EAT- MINT.) For a free copy of the brochure Smokeless Tobacco from the American Cancer Society. call 1-800-ACS-2345. And if you use smokeless tobacco, inform your doctor and dentist at your next visit.